How the Google Ads auction works, how Google determines which ad to show and where, and how it calculates how much you end up paying. As advertisers, we would all like to pay as little as possible towards our Google advertising. The reality, however, is with the present levels of competition and lower conversion rates, it’s getting even harder to achieve a good return on advertising spend. So, understanding how the Google Ads auction works will help you to optimize your campaigns effectively and help spend less to receive qualified visitors. It all starts with a search query. When someone searches with a query like ‘car insurance’, the Google Ads system looks at its pool of advertisers to determine if there will be an auction. So, if there are one or more advertisers that are bidding on keywords that are related to the query, then an auction is triggered. It’s important to note the difference between a keyword and a search query. A keyword is what you add in your campaign and a search query is what a person puts in Google as they search for your products or services. So your ad is only triggered when the keyword and the search query are closely matched and this is determined by keyword match types. As an advertiser, you get to choose the keywords to bid on. So, after doing some keyword research in Google Ads, you can group them according to themes and create related ads to target searchers. You will also set the bids for your keywords and this is one of the factors that determine your ad position. You can also use an automated bid strategy, which allows the system to determine the bids and position of your ads based on the goal of that strategy. Cost Per Click (CPC) bid – There are two ways to set your bids in Google Ads. You can set them manually at either of the campaign, ad group or keyword levels. Or you can allow the system to decide on the bid by using an automated bid strategy. Quality score – Quality score is a number between one to ten that shows the quality of your keywords. Your keyword quality scores are determined by three main factors: ‘Ad relevance’, ‘Expected click-through rate (CTR)’ and ‘landing page experience’. Each of these will have a status of ‘Above average’, ‘Average’ or ‘Below average’ which signifies how it’s performing. For example, if you have a keyword that has scored above average for the three quality score factors, then it will score 10/10. It’s important to note that the quality score is calculated at the auction time only and when you first launch your keywords, they will have a null score designated with the symbol ‘-‘. The calculation of these two factors determines your Ad Rank. So to have a higher Ad Rank, you can either increase your bids or improve quality scores or both. Increasing bids is easier and can be done in minutes, however, improving quality scores is much harder and requires working on your landing pages and ad relevance. The Ad Rank threshold is very important to your positioning on the page, whether it’s at the top (above organic results) or at the bottom. For example, if you have five advertisers looking to appear in the top four positions, the threshold for each of them will determine their position. Let’s assume they have a respective an ad rank of 80, 50, 35, 20 and five. If the minimum Ad Rank threshold required at the top of the page is 40, then only the two advertisers with ad rank 80 and 50 will appear there. This will determine things like click-through rates (CTRs), which are often higher for top-ranked ads above the organic results. And it also determines how much they pay per click and the volume of traffic they receive. 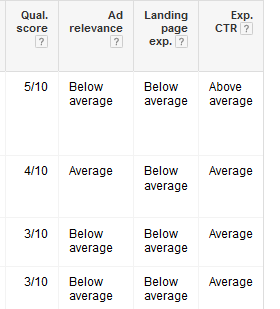 If the minimum Ad Rank threshold to appear on page one is 15, then only the top four advertisers will appear there. The advertiser with a threshold of five will appear on page two and could mean it gets no traffic or pays very little per click. The amount you pay for each click is known as the actual cost per click (CPC). You’re charged less and often far less than your actual maximum CPC bid. So the actual amount you pay at auction time is what is minimally required to maintain your ad position including ad formats such as site links. The first advertiser with the ad rank of 80 pays just enough to beat the second advertiser with the ad rank of 50. This is rounded up to the nearest billable unit, which in the U.S. is $0.01. So if advertiser two is due to pay $2.85 per click, advertiser one will pay $2.86 to maintain that position. And the same applies to the other three advertisers. However, at times you’ll find that the actual CPC exceeds your max. CPC and this will happen when you’ve enabled enhanced CPC or have bid adjustments. These two options bid higher if there’s a likelihood that the search query is highly qualified and will convert. Overall, the amount you pay for each click is a combination of many factors. And the level of competition is very important and helps you to determine your budgets. Mike Ncube is a Google Ads expert. He can be found on Twitter @mikencube.